Choose from a selection of 8 holiday rentals in Kostanje. Use the search form to the left to filter the results and pick your choice of self catering accommodation in Kostanje. We have a good selection of holiday apartments in Kostanje perfect for family, single, romantic and group holidays. You may prefer to take a look at our listed holiday villas in Kostanje or holiday apartments in Kostanje. Find your holiday homes by a specific type using the property type drop down in the filter. Filter the holiday homes in Kostanje by a specific area using the area list above. 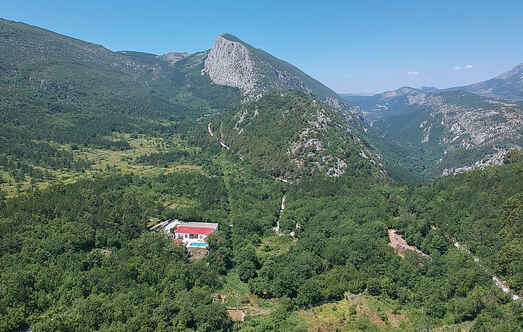 In Omiš hinterland near the canyon of the river Cetina in the village Kučiće in natural surrounding and on the plot protected from the view this beautiful holiday home is located. Relax in this bright and traditionally yet simply furnished holiday home, surrounded by lush greenery in the small and peaceful village of Svinisce. This simple holiday apartment decorated in Dalmatian style is located in a peaceful village, to which a hilly winding road leads. The apartment has one bedroom, living room and kitchen. This simple double holiday house lies within peaceful surroundings of a small village Podašpilje near Omiš. It consist of two floors connected by indoor spiral staircase. Bedroom number 2. This pretty renovated original Dalmatian house with a swimming pool offers unforgettable idyllic experience in the surroundings of untouched nature. This holiday apartment is located in a quiet place Podaspilje and surrounded by nature. An external staircase leads to the comfortable and well-furnished apartment on the first floor. Spend your holiday in this lovely accommodation on two floors, connected by outside stairs. It is located on a mountainous terrain of the village Podaspilje, surrounded by the nature.